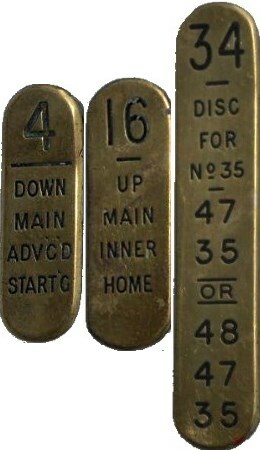 Lot 163 GWR Brass Signalbox Lever Plates x 3. All Good Condition. 4 DOWN MAIN ADV'C'D START'G. 16 UP MAIN INNER HOME. 34 DISC FOR No 35 etc.